"Putting smiles on people's faces is what being an school idol is about! And that's a wonderful thing!" 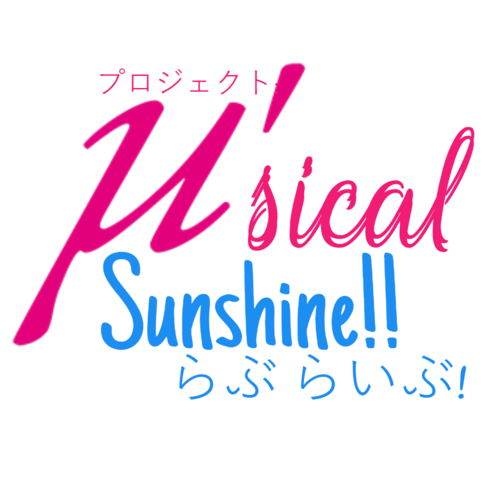 Welcome to µ'sical sunshine's member scouting! Howdy there, I'm Illya Qutesy (Illya) if you didn't already know me in the community! I'm here with a LONG-TERM group, I'm ready to start up a new one because the other one's I've had disbanded =_=. But anyways! We'll be predominantly singing in JAPANESE hence's the title of the scouting! We will be uploading all covers to YOUTUBE since it's a big platform. For this chorus I'm ONLY looking at the moment for females and males! SO AUDITION PLZ. Since I'm here I'll be talking about the schedule for our group, our debut song will be deiced by the group because this is a team effort so we all get a say in it. And there's something I'd like to address here as well, WE WILL NOT be singing overrated songs like Snow Halation, Start; Dash and such alike, why I want to apply this rule is because these songs are so over done, so the only reason why I'd ever let one of these songs slide by is if we swap the characters themselves, like Snow Halation (AQOURS VER). As of the moment I will not take any roles because I've been very sick and my voice hasn't been up for actual singing, so the role I pick will be based on the auditions I get. Also if you are wondering if we're ever going to sing St. Snow songs or A-RISE songs, yes we will but I will probably not get actual cast for them because it'd be such a waste so I'd rather have the St. Snow and A-RISE members to be backup rather than actual main cast of singers. And if your wondering whats up with the role placement is not based on who's voices is closest to who's. I assigned the roles by what actual roles they have in the Anime / Manga / PLOT (group *coughs*). 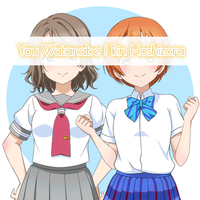 Like how Chika and Honoka are the leaders of their groups that's why I paired them up. (Some of them aren't equal or completely stuck to how I explained it but just roll with it) It's so nice to try out different ranges when your trying to suit the character. There's also something I'd like to mention to do with the roles as well. As I stated before when I said "I assigned the roles by what actual roles they have in the group" so this is also apply to the staff roles. Let's use Honoka / Chika for another example, the person who as that role will be the leader / co-leader (depending on their time timetable but they'll be the leader along with me if I don't choose that role) but anyways they'd also be the leader! 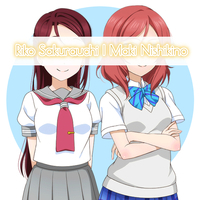 Let's do another example if you still don't quite get it, this time let's use Maki / Riko they'd be the mixers of the group because both of those characters compose the songs themselves so the closest I can a line them to the staff roles are the mixers! Of course you don't have to be, it's just a a higher chance of you getting casted and being closer to the characters. "With auditioning it self you can use instrumental or vocal only, I'm not too fussy about this"
1) Please have a decent microphone! Doesn't have to be a blue yeti or something alike but please have a microphone without too much background noises! If it's just the computer overheating in the background that can be mostly removed but if it's people talking in the background or just the quality of the microphone, I will not cast you. 2) If you're casted for this group please have a DISCORD setup or already active! This is our main way of communication and it's very easy to use. 3) Please know at least 50% to 30% of Love Live Songs! It's very important because we are a LOVE LIVE singing group so...it's pretty easy to know the reason. 4) Be able to turn in lines within or on the due date! Being able to get the vocals before the deadline will lessen the burden for the mixers because they won't have to catch the vocals up on you! 5) Please do not start fights within this group! My first group had to disband because of this reason and basically how it started is that someone was giving criticism to someone else's group WITHOUT permission and then the fight started like that, so PLEASE if you're going to give criticism to someone please ask them first before giving any information! 6) Please be mostly active! This is VERY important because from my experience a lot of groups have gone down because of the lack of cast actually starting up conversations and such! So at least be on every week or so, it's also nice to get to know the cast a little more! Honoka's voice is strong and consistent! Her voice isn't overpowering like Umi or Nico's though, it's smooth and energetic. Honoka doesn't really have any ranges worth note even in her solos she doesn't use many ranges like in "WILD STARS" you'd expect that she'd have a much lower range like Hanayo's or Nozomi's. So the range of her voice is normally around medium while still hitting those high notes! Ruby's voice is cutesy and girly, her voice is quite babyish and happy. In songs like SKY JOURNEY her voice is smooth and clear but in most songs her voice is a bit fogged up with her baby accent. Her voice isn't as high pitch as people say she is it does sound babyish but not high pitch like Kotori's, just very cute. positive influence on others and is motivated in everything she does. way out often to reach her goals. Honoka isn't very light on her feet. when she will achieve them. Ruby Kurosawa is described as fearful and easily upset, but still has a tough interior, forged by her role as a girl in a rich, well-known family. She is loyal to her friends and will stick up for them, but tends to be scared off easily. Ruby has never talked to any males besides her father before, so she has always been bad at dealing with the male gender. She is a shrinking violet, and very insecure about her status and tends to be the most childish out of the group. Ruby is timid, playful, clumsy and only raises her voice when her shyness hits. She doesn't take things very seriously but can tell when someone is troubled and makes sure said someone is okay. And since Chika is one of the lyricist of Aqours that person will help color code lyrics. 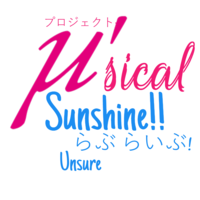 【UNEEDED BUT NICE TO KNOW】State anything you could potentially do for the group! Dia's voice in most songs are happy and airy, the airiness of her voice is like a bubble. Dia can also have a very low and strong voice shown in SKY JOURNEY but she rarely uses this but in general her voice is smooth and she sings in a mezzo range and sometimes slips up into the alto range. Umi Sonoda is shy and modest girl who comes off as well-spoken and calm. She is rational with decisions and is polite and respecting of others. stubborn perfectionist, wanting things to go correctly in her way. embarrassed and prefers to get things done her way to avoid hassle. 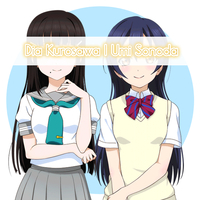 Umi and Dia are very responsible and natural leaders at heart! So the role that both of them will get the special role of the co-leader along with that the duty to promote the group in anyway hey can. notes. She shows some of these great ranges in STRAWBERRY TRAPPER, "MY LIST" to you, etc. Mari is very skillful as belting as well since her VA has been singing folk songs which needs a lot of control over her voice. about them. She is charming, kind and has a mischievous side to her. be very bossy and cruel while training others. 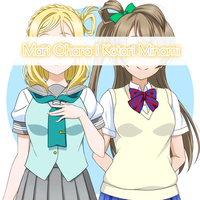 Mari and Kotori have nothing related to each other BUT since Kotori makes the costumes for µ's, if the scouted could possibly do art or sprite edit's. If sprite editing / art isn't your thing trying a hand out in spams all the servers you know with our covers! I'm sure that won't be annoying because...IT'S JOKE. Hanayo's voice is light, fluffy and just so adorable! But that's not the only voice she uses in the songs, she can use a deeper smooth voice unlike her voice cute and fluffy sounding voice. She sounds much more natural since it is her actual voice, Hanayo's voice can also be related You's or Ruby voice. Chika's voice is fluffy and upbeat! Chika's voice can be a bit overpowering and extremely strong at times like in "Thrilling One Way" but her voice can also be soft and sweet shown in "Yozora wa Nandemo Shitteru no?" The range of Chika's voice is soprano to mezzo-soprano, her voice is quite nasally while keeping a cute tone. obstacle that prevents her from letting her reach her full potential. 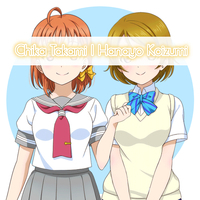 Chika Takami is described as sociable and rarely gives in easily. Her positive, can-do attitude gradually begins to affect everyone around her. She has a habit of explaining puns without being asked. She's spunky, fiery, and easily irritated by conflict. Although she is supposed to be a leader, she lacks leader-like qualities and is so idealistic so that when she is let down, it hits her hard. Despite this, Chika's so energetic that asking her if she wants to give up makes her more determined to succeed. Chika believes she is ordinary and boring, although she is seen by others as anything but. She believes wholeheartedly, how ever, that being yourself is what matters most. 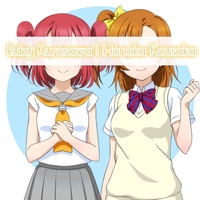 Hanayo and Ruby are the cute little creative babies of the group! Since both of them are told to be artist if you want to help out in the art department, then woot! Rin's voice is youthful and energetic! Her voice is similar to Eli's because of the smoothness in her voice. Her voice is very youthful and happy, despite her "tomboy" persona her voice is very cute, soft and smooth for her character but that's why a lot of happy really enjoy listening to her voice. You is one of the most unique voice's in Aqours, her voice is very VERY different from the others, her voice is very nasally and VERY airy it's like she has a very heavy accent to her voice, her voice is also very happy and energetic, but in some songs her voice can sound quite deep for her character. others, and jealous very easily. bother others with her thoughts, and refrains from speaking over anyone. She is a follower, and prefers to let other do things for her. Maki’s voice is strong and nasally, although her nasally isn't like Nozomi's or Nico's. It's a mature type of nasal, but even with that said her voice can get those high notes while singing and can sound very cute, this is shown in Hello, Hoshi wo Kazoete. Riko has a VERY VERY HIGH VOICE, a lot of people can say she has a mezzo range but in live shows and such (Which is how you actually judge their voices) she has one of the highest ranges, she can link up with Mari. Her voice always has a little squeak at the end and has a very smooth and pretty voice, which can also get a bit whiny shown in Shadow Gate to Love. gullible. It takes Maki a long time to get along with and trust others. having hostile tendencies, she dislikes conflict between others greatly. making mistakes. She, like Chika, finds herself boring and ordinary. Nico's voice is the most in character with the "AIDORU" persona, she constantly tries to fit into that even her singing! Nico's voice is very nasally, and very very similar to Maki's voice because of their sassy and nasally voices that suit each other. Although her "true voice" shines when she's singing in WILD STARS, this is probably the only time we get to hear Nico sing in her deep voice and it's amazing. Yoshiko's voice is cute and nasally, a little bit sassy like Mari's voice but still very confident in her voice. Yohane's voice is low and mature, her voice is one of the coolest in Guilty Kiss, Yoshiko normally switches between these two voices in most songs shown in STRAWBERRY TRAPPER but she only did this in the second verse after the first chorus. wants, she is also easily discouraged. are unhealthy and strange, but cannot quit the habit which upsets her. antisocial, and prefers to be alone and doing her own thing. 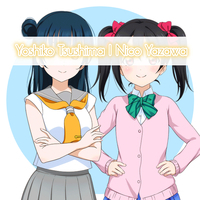 Nico and Yoshiko (YO-HA-NE!!) both are the type of people who like to spend most of their time inside and on their phone's or computer (haha ayyyy sh) So they'd most likely be helping / head visuals in animating. Nozomi's voice is soft, tender and nasally. There's not really much to say about her voice other than she sort of uses 2 while singing, her first voice is the one I mentioned before and the second one is much more deeper Shiranai Love, Oshiete Love. Hanamaru has the BIGGEST range in Aqours, but her voice is normally used on the mezzo range. She sounds at sometime's when she's singing like she's holding back a lot of her power in her voice but when the chorus hits she makes it really worth the wait to hear her angelic voice. when small inconveniences happen to her. 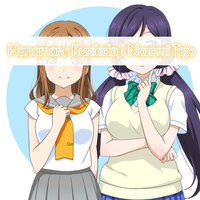 Nozomi and Hanamaru are the wise girls of their groups, both very caring and love to help their friends! Since it's a moral for them to help people why not do some guides that really do help groups? her solo hits her voice really shines. It seems like she's holding back a lot of power in her voice. pushed around by people that she's intimidated by. show-off when it comes to her skills. 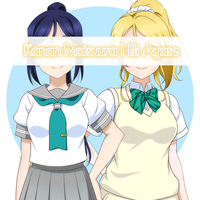 Eli and Kanan are pretty....and stuff.....I really don't know what to put for them so why don't I do a random role? Please put your vocal ranges in ONE audition so I can assign you to a role to audition for! 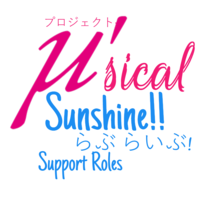 【IMPORTANT】Please sing any song (like any) and I'll help out with assigning you a role to audition for. The mixer's job is to put all the vocalist vocals together to make the song complete! Heads up as well, DO NOT use the Love Live solos to mix because they are already timed and such. Animator's will be making the video's for the group! They don't have to be flashy, we'd just like some one who could make a video for us! Illya is also willing to make graphic's in case the animator isn't sure how to. Sprite editors will most likely editing the characters for the Love Live videos but if you can make sprite's for Vocaloid go ahead. Artist's will be making the art mostly for Vocaloid, but they can also draw Love Live characters. 【Artist】Please PM / Comment us your drawing and the style's you can do.